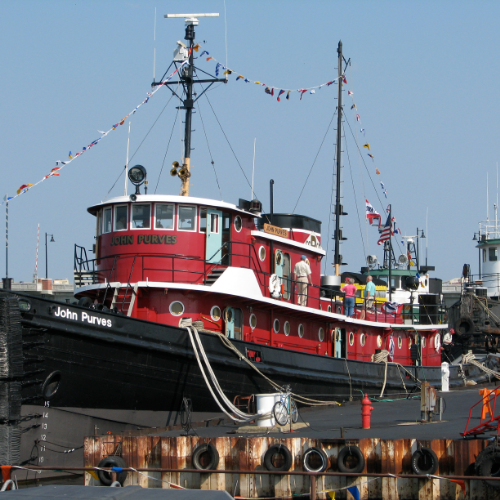 The entire Door County community is invited to celebrate the 100th anniversary of the historic tug John Purves at 11am on Wednesday, May 1st at the Door County Maritime Museum in Sturgeon Bay. The event will include the US Army Color Guard, the national anthem sung by Southern Door High School sophomore Brianna Partyka, birthday cake and more. Built in 1919 as the Butterfield, the John Purves has been painstakingly restored by a dedicated crew of volunteers and donors. Speakers at the May 1st event will include Museum Board of Directors Vice-President Terry Connelly; Purves volunteer Paul Graf; Museum Executive Director Kevin Osgood; and other invited guests. The tugboat will be outfitted with celebratory flags and bunting, including a 48-star United States flag, representing the nation as it existed when the tug was first launched.